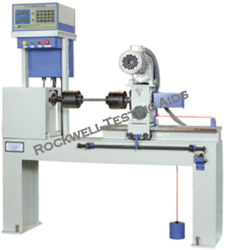 We are a leading Exporter of digital torsion testing machine from New Delhi, India. Suitable for Torsion and twist tests on various metal rods and flats. Torsion measurement by torque cell. One range with a high resolution throughout the range. Geared motor to apply the torque to specimen through gear box. Measurement of Angle of Twist by Rotary Encoder. Display of Torque & Angle of Twist on LCD display provided on data acquisition system. Facility for connecting the DAS Panel to PC. Accuracy of torque measurement ± 1% in the range from 4% to 100% of machine capacity.